MSU graduate student Scott Askew was selected as one of only 100 student veterans from across the country to attend a prestigious leadership institute in Texas. Askew spent the weekend learning from mentors, volunteer work, and leadership classes. Askew said he hopes to continue mentoring student veterans after retiring from service in fall 2018, thanks to his time at the Student Veterans of America Leadership Institute. Scott Askew, a Michigan State University graduate student in the Management, Strategy, and Leadership program, was one of 100 student veterans from across the country selected to attend the Student Veterans of America (SVA) Leadership Institute in Dallas, Texas, from October 19-22, 2017. The two main pillars attendees explored at the institute this year were “know yourself” and “results first, people always,” according to the SVA Leadership Institute website. These pillars were learned through volunteer work, mentorship, and leadership classes. Former President George W. Bush was the keynote speaker for the weekend, as his presidential library in Dallas hosted the entire experience. Askew said his favorite part of the weekend, however, was “hearing everyone’s stories of overcoming adversity and achieving success in academia as well as life during and after service." One reason he favored that part of the weekend, Askew explained, may be what he termed his “passion for making younger service members without a college degree—and many who have their undergraduate degree—see the benefits of becoming a lifelong learner.” Since his return to school in 2014, Askew said, he has influenced 40 soldiers to go back to school. Since SVA began in 2008, more than one million veterans have returned home to pursue a postsecondary degree or certificate using Veterans Administration educational benefits, according to the SVA website, studentveterans.org. To meet this need, SVA has grown to include over 1,300 chapter affiliates, and--with the nation’s renewed focus on veteran welfare--is committed to capitalizing on this momentum to ensure that "today’s and tomorrow’s veterans are supported in their transition to education and employment." The SVA Leadership Institute provides elite training for student veterans who are emerging leaders in their community, according to the website. The program is highly selective and brings together a carefully chosen group of student veterans. Askew said that he learned “so much from so many” at the SVA Leadership Institute that he is still processing it. However, he explained that the most important lesson from the weekend is that he must continue “creating the space for the next generation of veterans to gain greater access to higher education,” and that this mentorship should continue after his service ends in 2018. 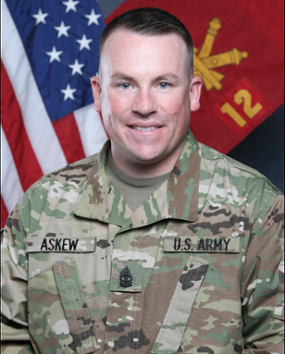 As of now, Askew is still active duty, serving as a Master Sergeant (E-8). He has an approved retirement and is transitioning to hanging up his uniform in September of 2018, after 21 years of active service. For more information about the Student veterans Resource Center in Student Affairs and Services at MSU, contact Sarah Mellon at 517-884-5973 or mellonsa@msu.edu.